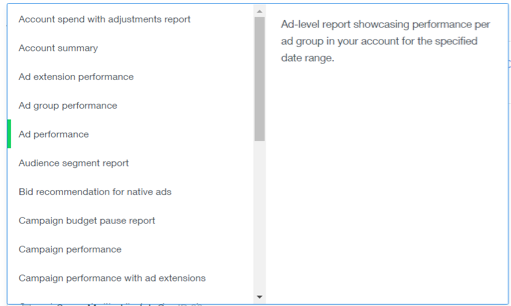 You can track performance and run custom reports easily in the Native & Search UI. Simply follow these steps. To access reports, click the Reporting tab. This gives you the option to Create Report. In the Select a Report option, click on a report that you wish to view. You’ll see a description of the type of data the report will provide you. You also have the option to choose from a list of performance reports that have pre-selected fields, or customize your report by selecting your own columns. Click Show Details to see the Fields & Dimensions that have been pre-selected. You may add or delete columns if necessary. When you hover over the columns, an up-and-down arrow will appear. You can rename the column and the arrows let you reorder the columns in which they appear. The Frequency provides you with the option of running the report once, or scheduling your report to be delivered daily or weekly. 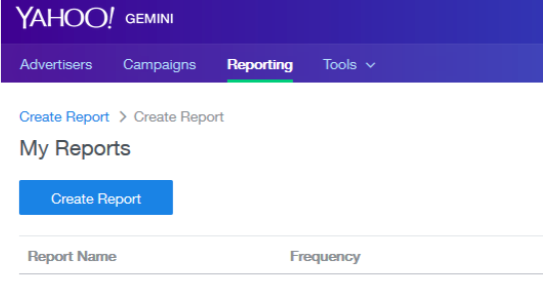 To run the report immediately, select the Once option. To schedule a report, simply set a daily or weekly frequency. 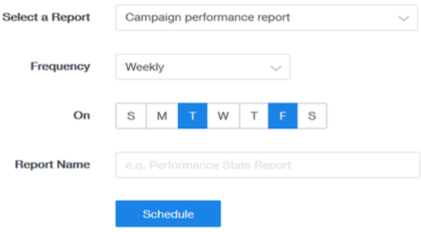 The Weekly option lets you determine on what days of the week you want the report to run. You may select more than one day, if applicable. The report name is customized to your liking. Click Generate to either run or schedule the report. If you have a scheduled report, you can turn off the scheduling by selecting the Status. Once the button is greyed-out, this prevents the report from delivering. You can also delete the report completely.